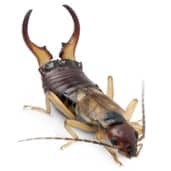 Earwigs are long, narrow nocturnal feeders that can be found in dark, damp environments. There are more than 20 species in the United States and 1,000 throughout the world. Earwigs got their name from an old myth about crawling into people's ears and tunneling through their brains with sharp pincers. While there is no truth to this old tale, earwigs are still nuisance pests and can cause damage to your garden. Earwigs do provide one benefit: they prey on aphids. However, in the process, they destroy plants very quickly, damaging seedlings, flower petals, soft fruits, and corn silks. Earwigs hide in small, moist areas during the day and at night, they come out to feed on insects and plants. Controlling earwig infestation is key to having a successful harvest this year. You can do your part by removing leaf piles, compost piles or other vegetation from around your home. You can also seal cracks and crevices in the walls of your house. PureGuard can help you control the earwig population in your yard, whether you're a home owner or nursery/garden owner. Call us at 615-502-2855 for your free quote and inspection. We can get rid of your earwig problem quickly and safely to minimize damage to your surrounding crops. Awesome customer service and did a great job. Very professional company and you can tell they are run well. No more Earwigs! I will definitely use them again.